Wall art is one of the best ways to dress up a space, but let’s be honest—hanging it is no picnic. From getting the viewing height right (rule of thumb: always hang a little lower than you think you should) to drilling the appropriate hardware into your wall, the process of artfully incorporating photographs, paintings, and prints into your space might seem easier said than done. This is why, when the time comes to renovate your space and display new art, it’s great to consider one of our decorator’s favorite shortcuts—a picture rail. A thin bit of molding that runs parallel to the ceiling, picture rails allow you to hang artwork from wire, making adjustments as necessary. The best part? When you want to move your art, you’re left with none of the mess or unsightly holes that traditional hanging leaves behind. Check out some beautiful examples of picture rails at work below. These two framed black and white prints work to elevate this rather spare bedroom while adding a graphic kick of visual interest that’s easy on the eye and not distracting. 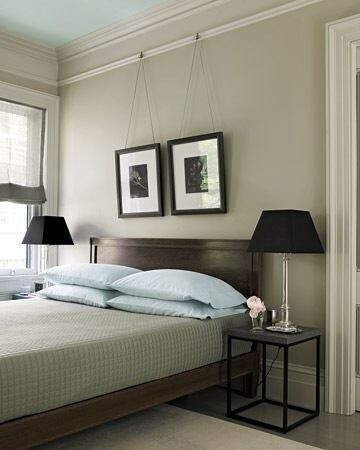 Plus, the hanging string lend the room more detail to catch the eye. Modern art in simple frames hang from a picture rail in the home of Stephen O’Connor and Annick Houle. We love the way that the different prints and pieces work together as an interesting collage similar to a gallery wall. Image source: Remodelista. San Francisco-based company Carlysle Manufacturing creates shelving specifically designed to hang on picture rails—you couldn’t ask for easier installation! Image source: Remodelista. Hooks for picture rails come in a number of shapes, colors, materials, and sizes. This copper option boasts an enviable time-worn patina that will lend even the freshest of pieces a touch of the old-world. Image source: Southern Living. Picture rails can be easily dressed-up or dressed-down like the one in this Brooklyn studio space. And for an artist, picture rails should come in handy as you can quickly move work when needed. Image source: David Ross. Have a collection of vintage prints and frames? Think of a picture rail as a modern and novel way to show off your prized possessions. Hung above a mantel, the placement and strings lend this traditional fireplace much more interest than a regular hanging would. For a similar look, plan an unexpected approach and go against the grain by playing with uneven numbers. A split print framed separately gives this classic buffet table a playful twist that’s sure to get their attention. Image source: Little Green Notebook. Jonathan Adler and Simon Doonan’s bathroom employs a brass rail above tile wainscoting for picture-hanging. If you’re looking to renovate your space, consult with your renovation expert to see the routes you can take to follow a similar course of action with beautiful brass features. Image source: Houzz. A picture rail is used to layer numerous pieces of artwork for an unusually three-dimensional effect in the Los Angeles design studio of Nadia Geller. Image source: Apartment Therapy. Share you collections with the world by artfully displaying them on authentic twine tied down from a picture rail for an elegantly rugged effect. We love the way this room features a gallery wall boasting historical prowess that’s compelling and inspirational to boot. Since instrument holders require various drilling techniques and heavy-duty applications that’ll leave your walls mangled and deteriorating, let picture rails come to the rescue! By using picture rails to feature your favorite instruments, you’ll be able to easily pull them down for use while insuring that they won’t leave a mark on your walls. Plus, it’s way better than leaving them stored away in their cases, suffering from neglect. Okay, so we just can’t seem to get enough of the idea of hanging shelves from a picture rail, and for good reason. By using a picture rail to temporarily hang shelves, you’ll be able to easily move them around when the time comes, and you’ll ensure that your walls stay safe and sound. But even better is the fact that they’ll appear to be floating from afar as there’ll be no clunky brackets needed. If you’re not blessed with picture rails or if the ones we’ve illustrated here are too tall for your tastes, consider using a molded chair rail to your advantage as an easel or shelf to display keepsakes, frames, plates, art, and sculptural elements. Image source: Ricardo Labougle, World of Interiors.